Ptolemy can be described as a polymath because his studies ranged across an astonishing array of disciplines, from astronomy and geography, to mathematics, philosophy, literature and poetry. The best indications place Ptolemy’s birth at about 90 A.D. in Alexandria, Egypt. He was known to be of Greco-Roman origin and a citizen of Rome, which ruled Egypt at the time. His first name, Claudius, is a marker of his Roman connection. He was either born into or granted Roman citizenship during the reign of the patrician family of Claudius. The Emperors Claudius and Nero ruled during the life of Ptolemy. Ptolemy is most famous for his ground-breaking work The Almagest, which is a treatise on mathematics and astronomy. It described the structure of the heavens as it was understood at the time. In Ptolemy’s day that meant that the earth was the center of the universe, and that the sun and other planets revolved around the earth. Ptolemy’s “geocentric” system was accepted for some 1,400 years. In the Ptolemaic system, the earth was not described as flat – as was the general belief – but as a sphere. Although the system was incorrect in that it was an earth-centered system in which the earth did not move, and the stars fixed, it nevertheless was highly useful for practical purposes, such as navigation and calculating astronomical events. Another of Ptolemy’s great works was called the Geographica – a comprehensive book which described the geography of the known world. Just as The Almagest became the standard text which explained all that was understood about astronomy, the Geographica was relied upon heavily for centuries as the standard text for knowing where cities and nations were located around the world. It included latitudes and longitudes, providing exact coordinates that sea-goers and travelers needed to find their way. 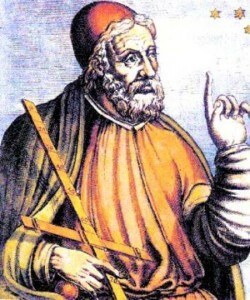 Ptolemy was the world’s foremost expert on astrology, which in ancient times was an extremely important and fundamental way of understanding the fate and workings of all humanity. He wrote a series of four books called the Tetrabiblos, which for centuries were the central “instruction manuals” for applying and understanding astrology. The ancients applied astrology to all aspects of life, from medicine to political systems. They believed that their fates were directly tied to the stars. As for the details of the life of Claudius Ptolemy, little is known and most is lost to history. Much of what is believed to be true about Ptolemy comes from texts that were written about him centuries after his death, and thus may not be accurate. Scholars are certain that Ptolemy was ethnically Greek and nationally a Roman – but also influenced by the ancient cultures of Egypt and even Babylon.